Edval Novaes studied law at Universidade de Caixas do Sul and journalism at Pontifícia Universidade Católica (PUC) de Campinas. Between 1986 and 1991, he was the first lieutenant of the Department of Armed Forces of Brazil. Later, he worked in public finance for the Court of Audit in Espírito Santo, Brazil. Novaes then joined Brazil’s Federal Police in 1996 and served on the Board for ten years, when he was invited to become the Undersecretary of Intelligence. 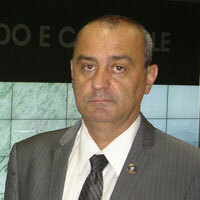 Beginning in May 2013, Dr. Novaes has been working with Secretary of Public Security to coordinate and integrate security initiatives from the Federal Police, Federal Highway Police, Armed Forces, Civil Police, Military Police, and Fire Department through the Integrated Command and Control Center. In addition to managing and monitoring the everyday actions of these public safety departments, the Center also includes a Crisis Management Office and a Major Events Monitoring Center. This Center and Dr. Novaes now face the challenge of using this technology to ensure the safety of Brazilian citizens and international tourists attending the 2016 Olympic Games in Rio de Janeiro.